And not just short picture books that you read at other times of the day...chapter books. Let's take the lunch to naptime plan. Once the children are sitting down to eat, talk about what happened in the story last time. It has been almost 24 hours, at a minimum. They forget. Some of the children fall asleep before you stopped reading. They missed things. This way everyone is on the same page, so to speak. Ask them what they think will happen next. I had one 2 year old who often suggested, "dinsaaarz will be 'der." This also gives the kids something to talk about at meal time (YAY! learning social skills!). As the children clean up from lunch and go to the bathroom (hand washing, teeth brushing, toilet/diapering) stand outside the bathroom with the book. If there are pictures, share them if asked. This is often a big hit with Pooh books, although there were also good pictures in Little Bear and The Littles. When most of the kids are on their mats/cots, ask if they are ready for the story. A chorus of "yes" generally erupts at this point. Settle down in your accustomed place and begin reading. If kids ask to see pictures, reply that right now they are building the pictures in their heads. "Close your eyes and build the picture in your head." They can look at the book after rest time is over, if that works for you. Depending on the age of the class you will read between 10 & 30 minutes. Find a good stopping point and place your book mark. During that time, the calm voice telling a story will have relaxed the children & with the eye closing to build pictures, many of them will have drifted off. There is less of the talking to the kid in the next spot, getting up for water or the bathroom and an overall calmer transition. Have you ever wondered about the benefits of all of that reading aloud before naptime? Not only does this bring you a calmer transition, it also helps with self-regulation, language development, literacy & imagination. Although reading to a child before bedtime is great, a team at the University of Sussex in England last year found that reading before afternoon naps is actually the most opportune time to enhance a child’s learning. Their research found that reading before an afternoon nap not only helped children to retain words better but also helped them to retain a greater number of words. So, rather than just putting on music or giving them quiet toys to play with, take time to read to the children. Whenever possible, do so before afternoon naps. By starting this practice early and building it into a fun and anticipated tradition, the children will gain benefits that last a lifetime. 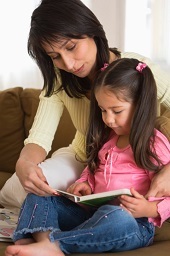 According to the American Academy of Pediatrics, it’s never too early to start reading aloud to children. As soon as a child is born, you can and should begin the practice, so that the child can become absorbed with books. Reading aloud with children not only creates a bond between the two of you – which is a side benefit – but it gives each child an important advantage. By age 3, children who have heard fewer words – whether though reading, talking or singing – may be at a disadvantage compared to children who have heard a greater number of words, and which may lead to a disadvantage in school. That was the finding of a study, “Meaningful Differences in the Everyday Experience of Young American Children,” conducted by Betty Hart and Todd Risley. Great! But what do you read to them? Sometimes this is a road block. How do you know what books are appropriate & will interest them? A good place to start is to think back to books you loved when you were first learning to read. I was a lover of all things Pooh, books by Syd Hoff, Captain Cat & Danny the Dinosaur in particular, and Another is to look at books or series that have been made into TV shows or movies. I will write another post with a list of books I suggest and a bit about each of them. Look for it soon. To get the post with the chapter book reviews & suggestions subscribe to this blog. Does your class have a favorite selection of children’s books that you enjoy reading aloud together before naptime? Share your happy tales with us on our Facebook page.